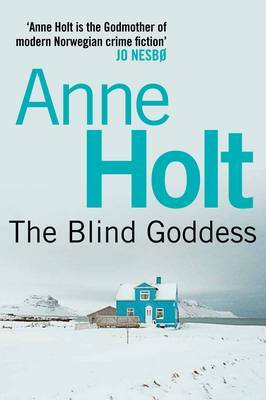 THE BLIND GODDESS is the first in an eight-book series about Oslo detective inspector Hanne Wilhelmsen, originally published in 1993 and here published in English for the first time. Despite the fact that the book is nearly 20 years old, it remains fresh and engaging; I highly recommend it. Karen Borg is a rich, successful lawyer who one night stumbles across a body in the woods. She's nauseated by her find, but calls the police. Some hours later, a young man is found sitting in the middle of the road, covered in blood. Hanne and her colleagues, of course, suspect him of the crime, but he won't speak, other than to insist that he's kept in a cell at the police station rather than being transferred to prison. He does, however, ask to see Karen. Despite the fact that she practices commercial law, he wants her to represent him in court. The book is a traditional procedural account of the investigation that follows, as carried out mainly by three characters: Hanne, Karen and police attorney Håkon Sand. As well as working with Hanne to coordinate the investigation, Håkon knows Karen of old as they were students together: compared with her, he's diffident and far less successful career-wise. These three characters are all extremely well-depicted, being vivid and convincing on the page. Hanne is something of an enigma at first, but we get to know this confident woman a little better by the end of the book. The story of Karen and Håkon provides a moving background to the case as it gradually plays out. As well as the good guys, there are of course the bad guys, some of whom are identified to the reader and others are more shadowy. They are all lawyers, bureaucrats or politicians. Through their eyes, we see a little of how the apparently simple crime is in fact the tip of an iceberg. The juxtaposition of the perspectives of the investigation team with that of the criminals provides the book with tension as the police team gradually tries not just to piece together the story (involving some great sequences with Hanne and her friend Billy T from the drug squad), but to create a case that will hold up in court - an apparently formidable task given that concrete evidence is hard to come by and, as the book's title implies, justice is blind.